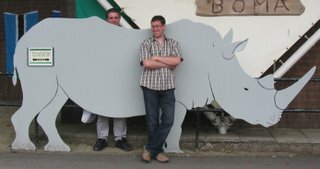 Darren Naish: Tetrapod Zoology: How big is a white rhino? Despite efforts to resist, I cannot help but post yet more Marwell Zoo photos. Mostly these photos were taken by Mark Witton: thanks Mark. 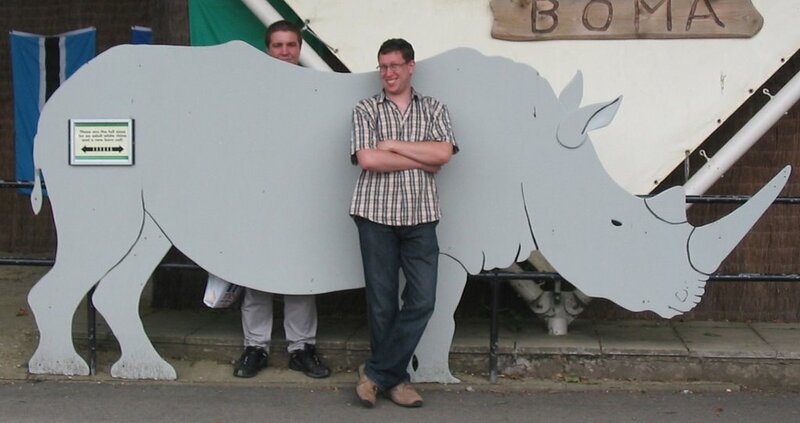 Firstly, I'm sure you're wondering how big a White rhino Ceratotherium simum is. Well, here's the answer. Ok, so it's a wooden cut-out and not a real rhino, but I assure you it's life-size. Graeme (at rear) is over 6 ft tall: I'm 5'10. And speaking of Graeme, here comes the long-awaiting, super-predictable photo entitled 'Graeme meets the folks'. He knew what we were up to when we took the photo. The artiodactyl in the photo is a charismatic and very friendly male Babirusa. Until recently I would have labelled the species Babirousa babyrussa, but - yet again - the species-level taxonomy of babirusas has recently been revised (for a previous post on over-zealous lumping in extant megamammals see Giraffes: set for change). A blog post is planned: if you can't wait until then check out Meijaard & Groves (2002a, b). Babirusa males have large curving upper canines that curve dorsoposteriorly as they emerge from the dorsal surface of the snout (yes, they emerge from the dorsal surface of the snout). This male is in the habit of covering his tusks with wet mud, thereby obscuring them from view. I have no idea why he does this and have never read of this behaviour. 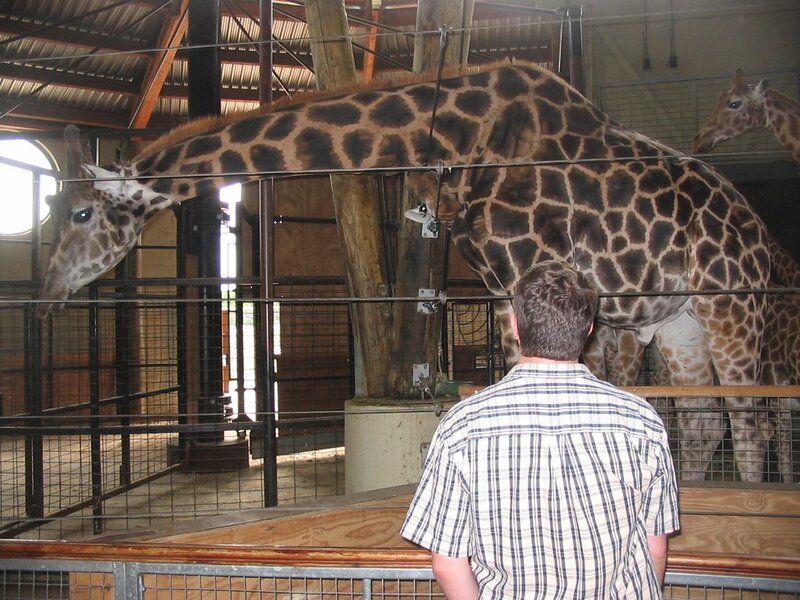 Here's a photo of my back and the big male giraffe they have at Marwell. I have nothing interesting to say about it, but you can never get bored with giraffes can you. As mentioned in the ground hornbill post, we were 'frustrated by anteaters'. What did I mean by this? Well, on my previous visit to Marwell the anteater had remained asleep and curled up, tail folded over its body and head (for photo go here). And this time it was in exactly the same place and exactly the same position. Except for a few brief seconds when it raised its tail and lifted its head: Mark was quick enough to get this photo. I suppose some time it might get up and walk around, but as for whether or not I'll ever see this, I do not know. Coming next: finally, the Cupar roe deer carcass (for background info see British big cats: how good, or bad, is the evidence?). For the latest news on Tetrapod Zoology do go here. Meijaard, E. & Groves, C. 2002a. Proposal for taxonomic changes within the genus Babyrousa. Asian Wild Pig News 2 (1),9-10. - . & Groves, C. 2002b. Upgrading three subspecies of babirusa (Babyrousa sp.) to full species level. Asian Wild Pig News 2 (2),33-39. Wow - I'd never realised just how big those rhinos really are! Thanks for the link to your earlier giraffe article - large-mammal taxonomy has always been an interest of mine, and I'd somehow missed reading that one. Now, picture yourself being pestered by a friendly southern white rhino; who wants you to scratch an itch. 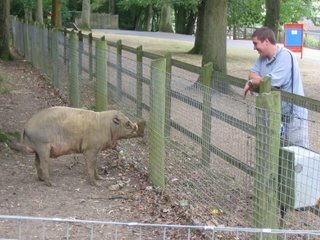 They have babirusa at Marwell Zoo? I need to go there. I have never seen one live. Of course your post begs the question: do male babirusa have any bracing adaptations? I just checked the papers. "Graeme folks" look hairless and have no tail tuft so they ought to be _Babirousa celebensis_. Much smaller than I expected. 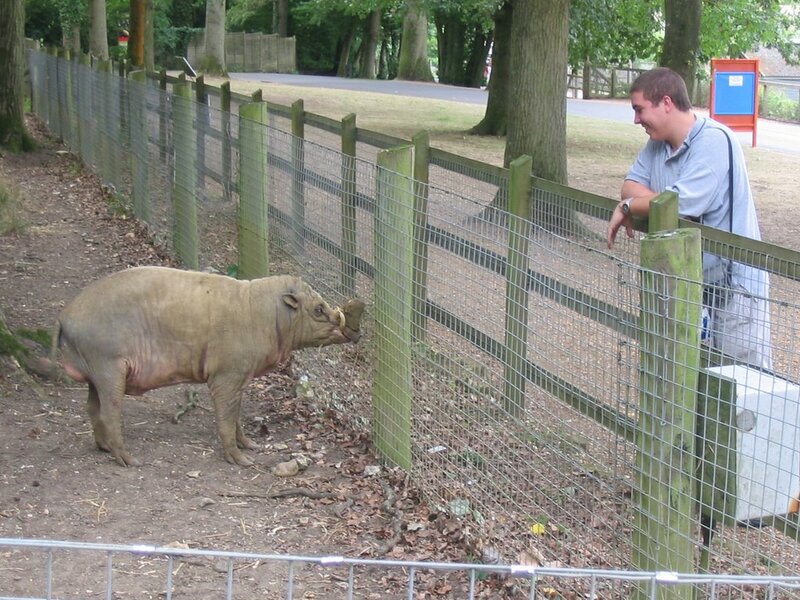 Yup, Marwell presently has a male and female babirusa (they've had them for years actually). Bracing adaptations? No, they're pigs not peccaries! Thanks for the species-level identification. More comments on this in a future post devoted to babirusas. As for being pestered by a friendly white rhinoceros, it might actually happen, since it is a remarkably docile animal, in marked contrast to the rather ill-tempered black and indian species. It is (also in contrast to the black and indian species) rather gregarious. The largest group of whites I've personally seen consisted of 7 animals, but larger flocks are mentioned in literature. I've never seen more than three black rhinoceros together, and that was at a waterhole and their interactions were anything but friendly! Your animal does indeed look different from animals I've seen in other photos. Though the hair is always very hard to spot on the body there is a tuft at the tip of the tail "yours" seems to lack. Maybe in your future post you can sort the tusk features and get a more reliable species identification. I found a photo from the same animal without the "decoration" here. It doesn't have the mud on the upper tusks, so it did that just for Graeme. The UK seems to have these beasts everywhere. I found a photo from one at Twycross Zoo, and another photo at Thrigby Hall Wildlife Gardens (there is also a photo of the female). So, next time I'm in the UK I'll check the Zoos. This animal was a bit unusual that it followed us around the enclosure, standing at the nearest point possible facing us, so maybe I looked like a food source or something. And for your information I'm 6 foot 2 inches (roughly 1.85m).